Please note that this is an e-book and is not deliverable by post! Ebooks are delivered over the internet, vastly reducing any pollution caused by a postal/delivery service. Consequently, Mothers Over 40 has a low C02 footprint. This also dramatically reduces the cost to customers, because it eliminates printing costs, the publisher's commission and the booksellers' discount. 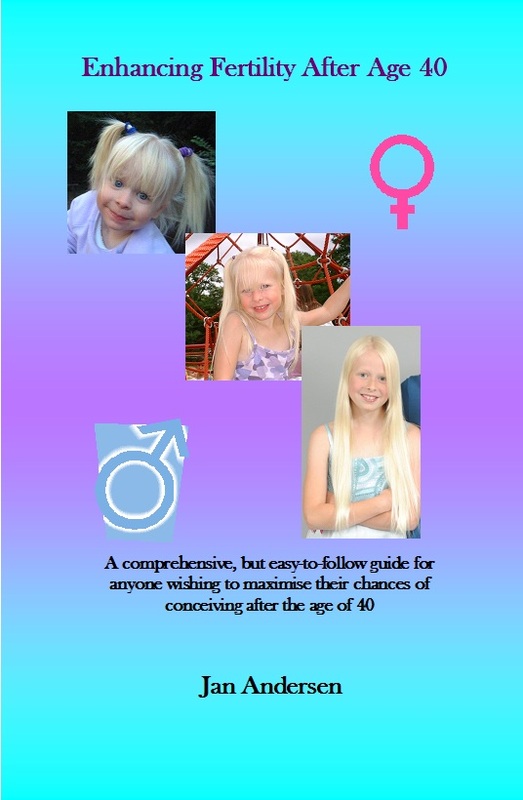 Please note that when you purchase a copy of Enhancing Fertility After Age 40, you are agreeing to the Terms and Conditions of Sale and Purchase. If you do not agree to the Terms and Conditions, then please do not purchase a copy of this book. Please also read the Copyright Notice and the Medical Disclaimer. Fertility is the major area of concern for women over 40 seeking to become pregnant, not least because of the abundance of negative statistics that serve only to cause unnecessary anxiety and decreasing hope. The truth is that may women have the ability to conceive naturally well into their forties and to give birth to perfectly healthy babies. The aim of this book is to help you maximise your chances of conceiving after the age of 40, taking into consideration all aspects of health and natural therapies to enhance fertility. It is not necessary to practice every therapy recommended within this book and my advice would be to assess your health as a whole initially and then choose a programme that you feel will suit your personal needs. This book also covers male fertility, which is a factor that some people forget to take into consideration, particularly when a woman is over 40 and the assumption is that she is the one with fertility problems. This is often not the case, with a high percentage of men suffering from infertility and sub-fertility in couples who are having difficulty conceiving. Fortunately, simple changes in diet and lifestyle can often help to alleviate these problems. If you wish to see the equivalent price in other currencies, then please click here to use the currency converter. The book is be available in pdf format, which is viewable with Acrobat Reader. If anyone has any problems with this format, please let me know. Please note: Once you have paid for the book, you will automatically be redirected to the download page. Please note that this download page is only available for a certain period of time in order to prevent the url being passed on to others. Just wanted to say that I thought your book was fabulous. I also loved that you were honest enough to share excerpts of it on the web before we had to purchase. And it was SOOOO cheap. Prior to that I have been fleeced by the"Pregnancy Miracle" - no previews, expensive, misleading and basically didn't tell you upfront you more or less have to go to a TCM practitioner. There was a bit of helpful stuff in there, but not nearly as good and honest as your book. Anyway - well done you - and this 45-year-old mother of one is trying again. Good to hear some positive stories and read useful tips. "This is a fantastic book! This gives us hope. Thank you very much for writing this, and please wish me luck! Thanks again." “I just wanted to write an say THANK YOU! I was at the point of no hope when a friend of mine recommended your book. At 44, I had been written off by so many doctors and was basically told to go away and forget about having another baby, or to consider egg donation. A little voice in my head told me that there was still a chance. After following the guidelines laid out in your book, I am delighted to tell you that I am now five months' pregnant and everything is going well. All the tests so far indicate that the baby is healthy and has no chromosomal abnormalities. I took great delight in writing to all those negative doctors and informing them that I managed to conceive naturally and that they should perhaps start to rethink their attitudes towards women over 40 wishing to have a baby without medical intervention. Thank you so much again. Without your book, I may have given up hope altogether." “While many midlife moms get pregnant “accidentally” (myself included! ), this book addresses men and women who are consciously attempting to conceive a child in midlife. For these folks, traditional methods have often failed them, and they find themselves at a loss as to where to turn next. Jan Andersen’s book “Enhancing Fertility After Age 40” offers the usual fertility advice, but better still, it offers hope as the author gently advises the reader about alternative methods and resources to try, many of which are available but not widely known. Ms. Andersen has a succinct style of organizing important data without appearing preachy or condescending. On the contrary, Ms. Andersen’s book is written in easy-to-comprehend layman’s terminology, and reads like one mom who has “been there, done that, bought the T-shirt” to another who is “Trying to get there – need help”. Julie Donner Andersen (no relation to Jan Andersen! ), author of “Parentally Insane: Insights From The Edge…of Midlife!” and “PAST: Perfect! PRESENT: Tense! Insights from One Woman’s Journey As The Wife of a Widower”, both available at Amazon.com. Please note that when you purchase a copy of Enhancing Fertility After Age 40, you are agreeing to the Terms and Conditions of Sale and Purchase. If you do not agree to the Terms and Conditions, then please do not purchase a copy of this book. All rights reserved. No part of this book may be reproduced in any material form, stored in a retrieval system or transmitted or circulated in any form or by any means, electronic, mechanical, audio, visual or otherwise, without the prior written permission of the copyright owner, except in accordance with the provisions of the Copyright and Designs Patent Act 1988 or under the terms of a licence issued by the Copyright Licensing Agency Ltd, 90 Tottenham Court Road, London, England W1T 4LP. Applications for the copyright owner’s written permission to reproduce any part of this book should be addressed to the author, Jan Andersen. Warning: The undertaking of any unauthorised act in relation to a copyright work may result in both a civil claim for damages and criminal prosecution. The right of Jan Andersen to be identified as the author of this work has been asserted by her in accordance with the Copyright and Designs Patent Act 1988. In no way should Enhancing Fertility After 40, or any comments made in this book by Jan Andersen be considered as offering medical advice. The information provided is by no means exhaustive. Anything contained within this book that is perceived as medical information is in no way a substitute for professional care. The content of this book is presented in summary form and is provided for informational purposes only. Please consult your own physician or appropriate health care provider about the applicability of any opinions or recommendations with respect to your own symptoms or medical conditions. The information in this book should not be considered complete, nor should it be relied on to suggest a course of treatment for a particular individual. Never disregard medical advice or delay in seeking it because of something you have read in this book. Jan Andersen does not endorse any specific test, products, or procedures that may be mentioned in this book. Any opinion expressed in this book or recommended resource is an opinion of Jan Andersen and the contributors. Jan Andersen does not assume any liability for the contents of any material provided in this book. Reliance on any information provided by Jan Andersen, or other contributors to this book is solely at your own risk. Jan Andersen assumes no liability or responsibility for damage or injury to persons arising from any use of any product, information, idea, or suggestion contained within this book. Any links to other websites or organisations may lead unintentionally to sites and resources containing information that some people may find inappropriate or offensive. It may also lead to sites that contain inaccurate information, false or misleading advertising, or information which violates copyright, libel or defamation laws. Jan Andersen makes no representations concerning any effort to review all of the content of external sites mentioned within this book.